6-month-old Kirti, born with a severe heart defect, is now fighting for her life in the hospital. As her oxygen levels deteriorate, she finds it harder to breathe. 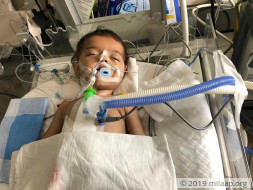 She needs to undergo a life-saving heart surgery as soon as possible but her parents’ financial condition is making this all the more difficult. A month ago, Deepak, Kirti’s father, noticed that she was breathing very rapidly every single minute. With time he also noticed that Kirti wasn’t as active and playful as a normal 6-month-old. Since Deepak and Jyoti, Kirti’s mother, have another 5-year-old child, they knew something wasn’t right and decided to get her checked. After an echo-test, it was found that Kirti was born with a heart defect and has developed a Complex Cyanotic Congenital Heart Disease. In simple words, due to physical abnormalities in her heart, Kirti can’t breathe normally and her health is deteriorating every day. Babies her age have oxygen levels in their blood to be above 95% but Kirti’s levels were at 49%. Her body is very weak and has not been developing, physically, too. Kirti’s state is very critical. Her Oxygen levels are deteriorating and she is fighting for her life. To have some chance of recovery, she needs to undergo an immediate heart surgery. Deepak is doing all he can, but as his financial resources have dwindled down to a minimum, he’s finding it very hard to provide for the surgery that could save his daughter’s life. Initially, Deepak and Jyoti took her to a government hospital to get checked. To get an echo-test, they had to visit another hospital, while Kirti’s condition worsened. Again, after learning about the defect, they had to take her to another hospital where she was given the right medicines for a few days. This was short lived as the hospital wasn’t equipped to perform the surgery she needs. Even with medicines, her condition didn’t improve and breathing got heavier than before. Kirti is, now, very critical. Finally, Deepak and Jyoti were able to find the hospital that could perform the surgery but they’re facing yet another obstacle after learning that just the surgery alone would cost around Rs. 2.5 lakhs. Deepak can’t afford this even if he worked for years. In addition to this, the doctors informed him that after this surgery, Kirti would need another surgery 2 years later. Deepak and Jyoti have been through a lot. Their baby's health is deteriorating every day, and this is unimaginably hard for any parent to watch. They are trying all they can to save her life. Deepak, who hasn’t gone to college, is working for a small company doing clerical tasks and errands. His savings, every month, are around Rs. 500. The estimated cost of just the cardiac surgery is Rs. 2.5 lakhs. Hospital costs and medicines would also be something Deepak needs to worry about. Deepak has borrowed Rs. 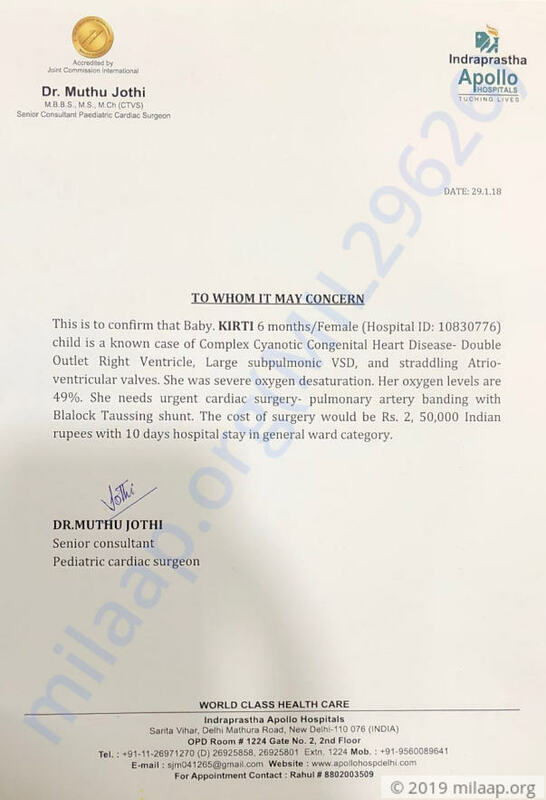 50,000 on interest, to get his daughter the medicines and treatments she has needed till now and has no means to provide for the life-saving surgery Kirti needs. Now, he needs your help to save his daughter. 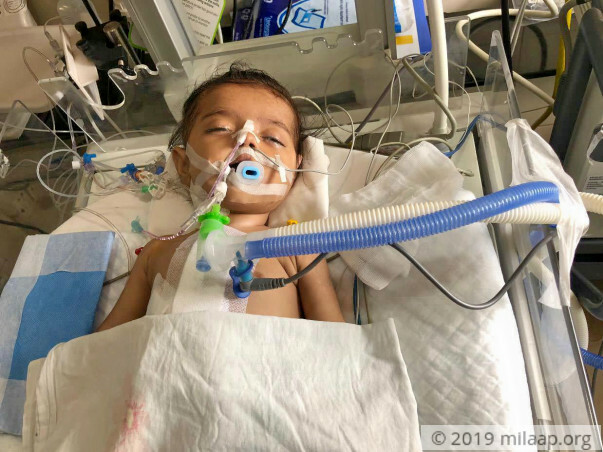 Kirti, a 6-month-old is born with a severe heart defect and is now fighting for her life in the hospital, where she awaits a life-saving heart surgery. Her father, Deepak, has been through a lot and has no way to provide for the surgery she desperately needs. Your contribution could save Kirti’s life. Here is a quick update on baby Kirti's health. Currently, she is at the hospital and doing better. There has been a lot of improvement in her health for the last couple of days. However, she still needs moderate oxygen support for some time. Doctors can advise about the future course of action after oxygen support is removed. She is on regular medication and we would need to visit the hospital for regular check-ups even after she is discharged from the hospital. Please pray for our child's health and speedy recovery. Thank you for the wonderful support that you have shown towards Kirti. She is doing better now compared to earlier and her health is slowly stabilizing. She is currently in the ICU and will be under observation in the ICU for another week and we are increasing the target amount by another 1 lakh to meet the expenses. Thank you all for the wonderful support that you have shown towards Kirti. Will keep you posted. Thank you for the support you have shown towards baby Kirti. She has undergone the surgery and is doing well. She is still in the ICU and making satisfactory progress. She is off the breathing machine. However, she will need another 5-7 days stay in the ICU before complete recovery. 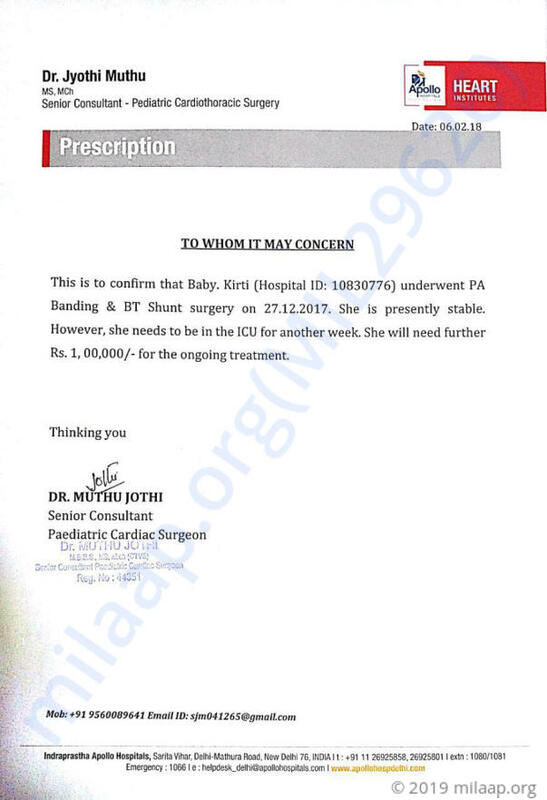 I would like to thank all the donors for the wonderful support that they have shown towards baby Kirti. Do share the campaign further with your friends and family to raise funds for her treatment. Will keep you posted.